locations in loads of films and TV series. St Mary's Rd from co001, on the other side of the road and facing south. been rebuilt on the near side. in placing the shot opposite West Ealing Station. Drayton Bridge Rd as claimed. The corrected caption is also wrong. yards across Ealing Green from the entrance to Ealing Studios. when the roof of the building on the corner went up in flames. Inspector Morse's house and may be also be used in Lewis. And there is a pub in Ealing High Street, called the Basil Dearden. A pint anyone? their areas to our surfers. visitors to film location sites throughout the world. Liverpool, Camden and Hammersmith, probably best you don’t waste your time. they don’t want our help. They have, obviously, too many tourists. The cinema was invented in the late 1800’s, and the tremendous interest that it created gave rise to many very early “stars”. Some of these beautiful ladies, then, as now, were seduced by the glamour of the occasion, the attention they attracted from the rich and famous, and, in the terms of the Victorian novelists, often “suffered a fate worse than death”. Because of the reputation of the music halls, any public dancer, including the most famous ballerinas, were often considered to be of a lower moral fibre than the virtuous women, and their equally virtuous husbands, in the audience. Many actresses on the legitimate stage, unless famous, and then approved by society, were also thought of with less than kindness. The advent of photography, and its ease of reproduction of still images gave rise to the postcards of the end of the nineteenth century, and their proliferation in the fist years of the twentieth. Postcards were printed by the million and distributed to all corners of the world to be sold, and, where postal services existed, sent to friends. About the same time the cigarette card companies began to insert small photographs into their packs, the first cigarette cards, and they chose a wide variety of subjects, many of which had also been previously used by the postcard producers. The printing company had the original art work, sketch, drawing or negative and it was thus a simple matter to reproduce similar cards, but in smaller sizes. Many of these cards, of which thousands of sets exist and are well documented, fetch, for a complete set, hundreds of pounds, even more Euro and twice as many dollars. There are numerous catalogues and lists which index and describe these cards and also give valuations. But, in all these sites and learned works there is rarely, if ever, a note about Danckleman & Schrader, their company, or their cards, thus establishing their rarity, and with notable famous beauties of their day, desirability..
Danckleman & Schrader was the name given to a cigarette company in Montevideo, Uruguay, who, in the first few years of the 1900’s, as an inducement to purchase their Cigarrillos Londres brand of cigarettes, began to insert small cards into their packaging. 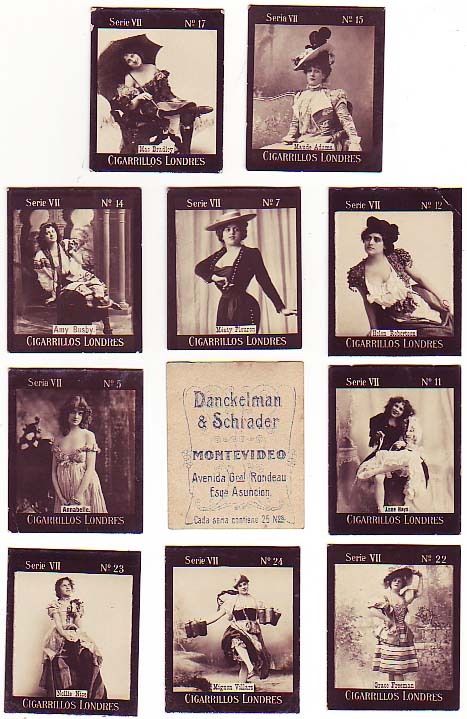 Cigarette cards. Some of their early sets were devoted to Bullfighters, a pastime then popular, and legal in both Uruguay and Argentina, as well as Children and pretty Views. Later sets exploited the lure of sexual attraction. Most smokers were men, and some forty two series included famous beauties of the day. Most of these girls have been lost to view. Who now remembers pretty Mae Lowery? But some, like Meaty Fleuron; and if ever there was an unfortunate name this must be one of the best; lives on in immortality in Ogden’s Guinea Gold cigarette cards, and also in the D & S card No 7 in the seventh series, VII. Maude Adams, an idol of the American theatre and a book has been written about her. Amy Busby was a friend of Gertrude Lawrence and appeared also in the Sweet Caporal Cigarette card collection. Helen Robertson might have written, or appeared in a novel published by the Olympia Press. Anna Hayes faded from view. Grace Freeman, a US musical comedy actress, was another of Ogden’s Guinea Gold girls. Mignon Villars, Ogdens again, and also appeared in the Sweet Caporal Cigarettes series. Of Annabelle, Mac Bradley and Nellie Nice, from this series, we know no more. Although of South American origin Danckleman, or Schrader bought in beauties from North America and Europe, no local girls appear to have been used. Someone in the printing business perhaps sold these early images as a job lot, or maybe even did the printing. 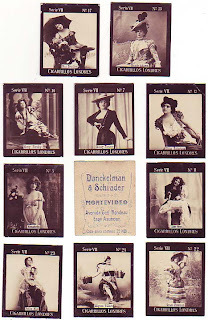 The Girls of Series Seven, is an incomplete set of these unique Danckleman & Schrader cigarette cards, eleven cards out of a set of 25, all are in excellent condition and cost £ 20.00 each, postage included, insurance is an extra £4.50. And how many of these girls appeared in early films and movies, whose locations we haven't yet examined.